LEARNING TO WALK AGAIN WAS THE EASY PART. LEARNING TO LIVE AGAIN WAS THE CHALLENGE. FINDING THEO restores the faith in the goodness of people, and something bigger than all of us. John Stankey, CEO, WarnerMedia says, "FINDING THEO restores faith in the goodness of people and something bigger than all of us." On September 17, 2013, 25 year old Theo Krause, is in peak physical condition when he joins three friends for an afternoon of mountain biking on a remote trail in Crested Butte, Colorado. He rides ahead of the group to capture them on video as they whiz by, laughing, then repacks his camera and jumps on his bike to catch up. The earthy smells of the forest floor fill his nostrils as he gains speed, descending into a deep ravine. Suddenly, his bike hits an awkward bump in a turn catapulting him headfirst into a lone aspen tree, splintering his neck, and leaving him unable to move his arms or legs. He thought, "This is where I will die." Hours later, five hundred miles away, a phone call in the night shatters an ordinary evening at home, plunging his parents into a nightmare. The news is devastating. Their son will never walk again. 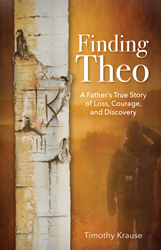 FINDING THEO: A Father's True Story of Loss, Courage, and Discovery by Timothy Krause, is a father's raw account of his son's courageous fight for life. It is also a deeper story about the people whose lives became interwoven with Theo's: the son of an Iranian immigrant (a map maker by profession) who found Theo on the side of the trail and aware of their exact location and went to call for help, four Swedish-German women on holiday, one a pediatric nurse who knew what to do until help arrived, the 9-1-1 call that triggered a mountain rescue by a specialized search-and-rescue team while a Care Flight helicopter crew position for a dangerous airlift, the medical professionals, and the cast of family and friends who guarded his soul. Refusing to accept his prognosis, Theo fought with grit and determination. He notes, "My dad says I have always chosen the difficult over the safe, relishing the challenge, but when a mountain biking accident left me with a broken neck and a spinal cord injury, my perspective of a challenge shifted to surviving, recovering, and adapting to a new "normal." Through fortuitous rescue by strangers, emergency surgery by gifted surgeons, relentless rehab guides, and the love and support of my family and friends, I have had the opportunity to learn that joy can come from suffering and that empathy leads to happiness. These lessons did not come easily." Dr. Kirk D. Clifford, MD says, "Theo's determination, strength, and spirit were inspiring to me all who encountered him throughout. Finding Theo is a testament to the capacity of the human spirit." A thought provoking narrative, Finding Theo is "No ordinary miracle tale, this inspiring memoir of a parents worst nightmare unmasks a vigilant world of complete strangers converging in courageous battle for life against an unthinkable future." Inexplicably, what were the chances that these particular people from around the globe would be at the right place at the right time? Was it, perhaps, miraculous? Timothy Krause spent thirty years in the world of high technology, ultimately serving as chief marketing officer of one of the world’s largest suppliers of telecommunications products and services. The son of a preacher, Timothy lives at the crossroads of science, religion, and the arts. Finding Theo represents the culmination of a journey precipitated by a horrifying accident in which these worlds collided. Today he is a member of the Deloitte Consulting Game Changer Program. He also provides leadership, business strategy, marketing, and business development advice as an independent consultant, and is a popular motivational speaker. He is a director of the World Affairs Council of Dallas/Fort and is a passionate supporter of Our Friends Place, a Dallas based nonprofit dedicated to helping young women break the generational cycles of abuse, neglect, and poverty. He holds a BA in physics from William Jewell College, which in 2015 awarded him its highest honor for distinguished alums, the Citation of Achievement. He also holds the MBA in business management from the University of Dallas. Timothy met his wife, Jorja, a music education major, during a college choir tour. Together they have raised two children, lived and worked abroad in Paris, France, and currently reside in Dallas, Texas. Theo Krause is the head concierge at a Landmark Hotel in Washington, DC. Previously, he worked for Ritz Carlton Hotels. He worked as a professional snowboard instructor for Vail Resorts and continues on a seasonal basis, having successfully passed the Professional Ski Instructors of America and the American Association of Snowboard Instructors (PSIA-AASI) Level 3 Certification in 2015, two years after his mountain biking accident. Theo has been nominated five times for the Ritz Carlton’s Five Star award, the hotelier’s top service award, and has received the award twice. He was runner up as employee of the year in 2017. Theo speaks to a range of audiences about his experience in recovery and his passion for great service. He also joins his father for speaking events. Theo received a B.A. in international business with a minor in economics and a B.S. in French from the University of Denver in 2010. He also studied one year at University Dauphine in Paris, France, in 2009. He recently moved to Washington, D.C. together with his adopted cat, Oliver.